Take That have today issued a statement saying that they will be rescheduling Tuesday night's Liverpool show. 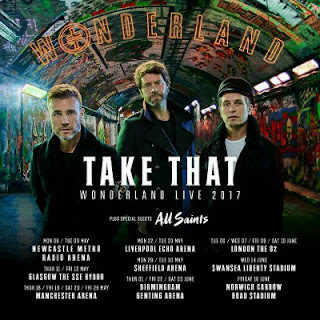 The band played at the Liverpool Echo Arena last night, and were due to play again tonight as part of their 'Wonderland' tour. Blondie, who was also set to perform an intimate gig tonight for Amazon Prime, is also rescheduling. Out of a mark of respect for the victims of the terrible attack at the Manchester Arena last night, Amazon and Blondie will not go ahead with the Prime Live Event scheduled for tonight at the Round Chapel in Hackney, London. Amazon is working together with Blondie to reschedule the event.